Grow the best selling magic mushroom strain at home from this spore syringe (10ML). B+ is a very-easy-to-cultivate strain. 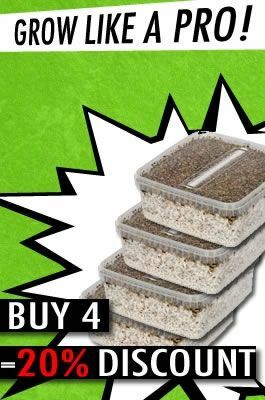 Ideal growing circumstances are best if you want to create really large mushrooms, especially a substrate that is rich of nutrients is important here. A really big caramel colored cap will be formed then. But the B+ mushrooms will also grow quite well under mediocre conditions. Cap: 25-75 mm in diameter, hemispheric to convex expanding to broadly convex to nearly plane with age. Dark red maturing to golden brown. Surface viscid with apparent gelatinous layer when very wet, soon smooth from drying. Fine fibrillose veil remnants when young that soon disappear. Flesh white soon bruising bluish green. Stem: 150-200+ mm in length. Typically equal, sometimes slightly enlarged at base, sometimes contorted. Yellowish to buff with a reflective sheen, bruising bluish, hollow. Partial veil membranous leaving a persistent membranous annulus that is well dusted with purplish brown spores even before tearing away from the cap. The B+ is formerly misrepresented as Psilocybe azurescens. Detail of separable gelatinous pellicle: This feature seems to be unique to the "B+" among cubensis. When young and fully hydrated the cap has a transparent amber colored layer of cells that quickly oxidizes upon removal to a more opaque blue gray color. The texture is like a thin stretchable layer of gelatin. Note the area where the pellicle has been removed is dull. I am Mr.G the isolator and creator of the B+. I never sold it or made a penny off of it. I gave it to selected vendors whom I felt were honest and reliable. I am much more into Lab work then selling and don't need the money. Sporeworks purchased it and bad mouthed me because nothing is "authentic" unless he says and he has no formal education in mycology, genetics or lab work! I am half cherokee Indian and all I asked was that people please give credit to the creater. The B+ was a spore print purchased by me from JLF in 1995. Due to a lab accident where the spores were heated to 250f at 15psi for 30 minutes. I was trying to see if it was practical to resterilize syringes. I filled the syringes with Pan. Tropicalis spore solution and the mycelium that formed was the strongest, whitest, healthiest I had ever seen. It was not pan mycelium. When it fruited it was B+, 5 different mycologists have said it is not a cubensis or an azurescen. It is it's own mutated species due to the mutations from the heat. Ever heard of evoloution?? The syringe broke almost immediately and half the liquid spilled out. Viable spores.Its not dark,but works.No contamination issues.